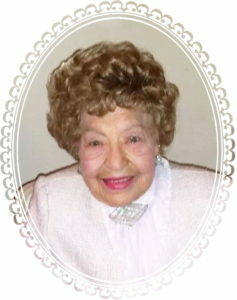 Mary T. Kowalski died peacefully in her Elm Park home of more than 95 years on December 28, 2018, days after celebrating her 101st birthday. Mary was born on December 18, 1917, to Thomas and Nellie Kowalski. Her parents, brothers John and Stanley, and sisters Josefina and Ann Damitz predeceased her. Mary is survived by her loving sister Rose Laub, 12 cherished nieces and nephews, 18 great nieces and nephews, and 25 great-great nieces and nephews. Mary attended St. Adalbert School and McKee High School and worked for 36 years in the Proctor and Gamble factory in Port Ivory. She loved to travel and visited Poland, Switzerland, Germany, Spain, Argentina, Mexico City, Paris, London, and Hawaii. A devout Catholic, Mary had especially fond memories of her trips to Vatican City and the Holy Land. Most importantly, Mary was a kind, sincere, and generous woman who became everyone’s favorite aunt. She acknowledged everyone’s birthday and wedding anniversary and attended special occasions in stylish fur coats, heels, and gold jewelry. For countless years Mary filled her living room with Christmas presents for her nieces and nephews that would surprise and delight them and occasionally take their breath away! She babysat, baked pies, and made coleslaw and fried bologna sandwiches for them. In her later years Mary enjoyed the simple things in life – sitting on her porch, conversing with family and friends, and watching TV. She especially enjoyed watching the Notre Dame football games, the NY Mets, Turner Movie Classics, and Jeopardy. She was also a devoted fan of Andre Rieu, Liberace, and Lawrence Welk; and an avid reader of the S. I. Advance, Daily News, and N.Y. Post. Mary devoted her life to her family, her church, and her community. She made our world a much better place. Friends may call at the Cherubini McInerney Funeral Home, 1289 Forest Avenue, on Friday, January 4, from 2 – 4 pm and 7 – 9 pm and on Saturday at 10:15 am. A Mass of Christian Burial will be celebrated on Saturday, January 5, at 11 am at St. Stanislaus Kostka Church, 109 York Ave, Staten Island, NY 10301. In lieu of flowers, donations to St. Jude Childrens’ Research Hospital or The Missionary Oblates of Mary Immaculate would be appreciated.